Let's start describing the 2008 Cristal technically first. It is a 60/40 blend of Pinot Noir and Chardonnay from 36 plots in seven grands crus: Verzy, Verzenay, Beaumont and Aÿ for the Pinot Noir and Mesnil, Avize and Cramant for the Chardonnay. Twenty-five percent of the wine was fermented in oak, and 16% underwent malolactic fermentation to moderate the fresh acidity of the 2008 vintage. The assemblage was bottled in May 2009. After 8.5 years on the second lees (longer than any Cristal before), the first release was disgorged in September 2017 with a relatively low dosage of 7.5 grams per liter. So, here is how it tastes as a "young" cuvée: The 2008 Cristal opens bright, super clear, fresh and pure on the exciting, absolutely fascinating nose with its fine, complex and elegant bouquet of gorgeously ripe and matured fruits, brioche and chalk expressions. This is the finest you can get from Champagne. The palate is pure, lean, fresh and filigreed but concentrated, highly complex, full of tension and enormously vibrant. This is a great vin de terroir, a dense and elegant Super-Cristal that goes straight and precise as a laser beam over the palate but also has texture in the form of sensually fleshy fruit. The dosage, however, is the lowest ever: just 7.5 grams. The endless and highly tensioned finish is complex, citrusy fresh, full of chalk and crystalline finesse. 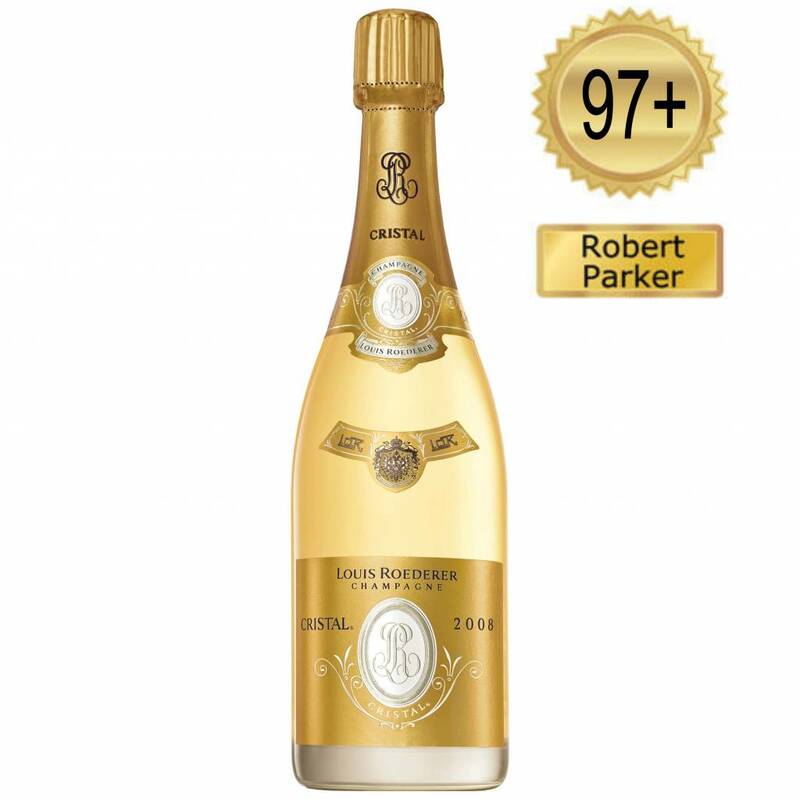 The 2008 Cristal is a vitalizing drug, "the Chevalier Montrachet of Champagne," as Jean-Baptise Lécaillon puts it. It is the most exciting 2008 Champagne I have tasted thus far (May 2018). The 2008 Cristal and Cristal Rosé come two years after the 2009. "The 2008 is launched after the 2009 because of its impressive personality. The wine wasn't ready two years ago, whereas the 2009 was brilliant,“ says Jean-Baptiste Lécaillon, cellar master at Roederer since 1999, during my visit at the domaine in Reims in May 2018. Later this year, Roederer will also relaunch the famous 2002, which was disgorged in 2010 and of which Lécaillon kept a few thousand bottles apart for three-star Michelin restaurants, enabling them to offer several vintages of Cristal. "The 2008 vintage was a continental year with a slow and late ripening process due to an unusually dry and cool summer. Under certain circumstances, ripeness could have been difficult to achieve,“ Lécaillon explains. "This was also the case in 1996, which we eventually picked a bit too early due the pressure given by rot. In 2008, however, I waited a bit longer, maybe a week or so, to lower the high acidity level naturally. I also did malolactic fermentation in 16% of the volume, which is not much, but enough to soften the acidity. Last but not least, the 2008, which we bottled in May 2009, spent eight and a half months on the second lees before the disgorgement—longer than any Cristal before. The resulting taste is incredibly pure, like spring water from the rocks..." In fact, the Cristal is a great combination of freshness, salinity and finesse with power, concentration and complexity. The 2008 Cristal Rosé is still terribly young and fresh but highly promising. The true class of both is something we should debate again in five to ten years. So far, the 2002 Cristal and especially the Cristal Rosé are unrivaled masterpieces, yet there is something in the air that smells...incredibly chalky! 2009 is also a continental but very sunny year following a very cold and dry winter. The summer was "glorious,“ full of sunshine "and almost no rain in August and September.“ These conditions led to ripe grapes with excellent health and enabled team Roederer to produce fine, very elegant, deliciously light but fruit-intense cuvées of great balance and harmony. The 2009 Cristal is pretty reductive at the moment, and according to Lécaillon, this will remain for about 15 years following the harvest. The Cristal Rosé combines purity and finesse with texture and complexity. It is an age-worthy wine with substance and the precision of a laser sword.